Josh Adams suffered a hip injury late in the week that had his status in doubt. 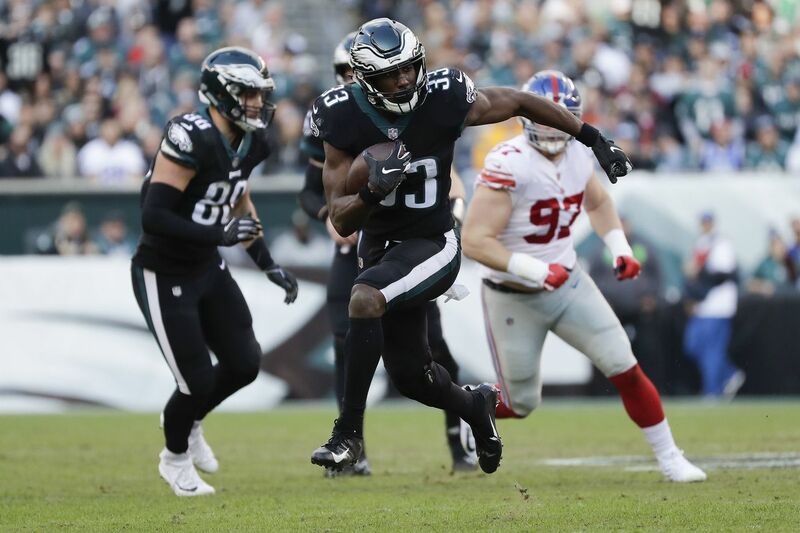 Eagles running back Josh Adams is in the lineup on Monday against Washington after a late-week hip injury had him questionable for the game. Adams is expected to start and be the Eagles' lead running back. Left tackle Jason Peters is also active, as expected. He was not with the team leading up to the game because of a personal reason. The Eagles' inactives are linebacker Jordan Hicks, defensive back Avonte Maddox, offensive lineman Jordan Mailata, cornerback Jalen Mills, offensive lineman Matt Pryor, quarterback Nate Sudfeld, and offensive lineman Chance Warmack. Hicks (calf), Maddox (knee/ankle), and Mills (foot) were all declared out for the game because of injuries. The other players are healthy scratches. Michael Bennett will play even though a foot injury had him questionable for the game. Darren Sproles is active for the first time since Week 1. Nigel Bradham will play with a broken thumb. He wore a cast on the thumb throughout the week after undergoing surgery last Monday. Nate Gerry and Kamu Grugier-Hill will be the other starting lineups with Bradham. Sidney Jones and Rasul Douglas are in the lineup, too, after recovering from injuries. Jones was absent last week because of a hamstring injury. Douglas played only an emergency role last week with ankle and knee injuries. Look for both to start for the Eagles. Corey Graham will start at safety. The Eagles could use Cre’von LeBlanc as the slot cornerback.